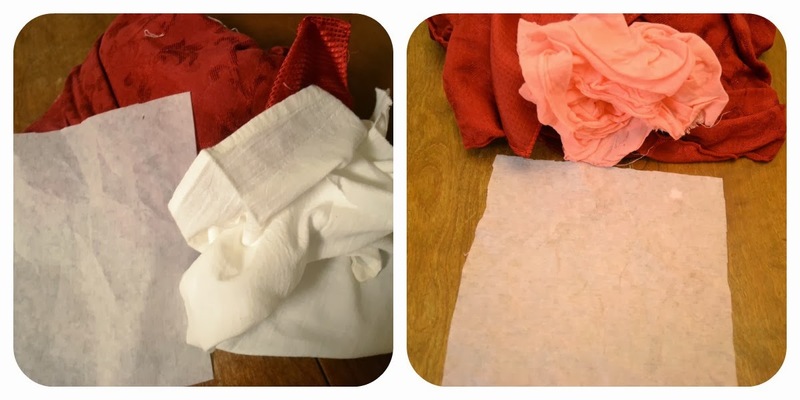 The Frugal Pantry: Can You Make Your Own Laundry Color Catcher? Can You Make Your Own Laundry Color Catcher? I have not purchased the commercial Color Catchers that you toss in your wash to protect them from colors bleeding onto other fabrics. I just try really hard to sort well and check pockets for surprises. But, I had seen several posts for making your own color catchers and I wondered if they worked. The posts that i had seen either didn't show any photos or the photos they did show weren't a resounding endorsement in my view. 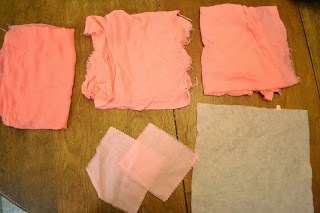 The first color catcher involves soaking fabric squares in a water/Washing Soda combo. and the second one involves a water/salt combo. after these fabric squares dry they are supposed to be a one time use color catcher. Each set of pictures below I tried to show both the color catchers and the white cotton towel I used to test with along with my nemesis: the red tablecloth. 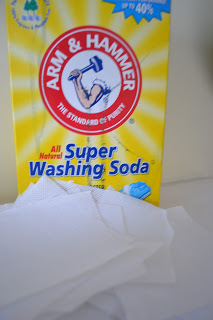 The directions were to soak cotton or felt white rags soaked in 1 cup water mixed w/ 1 Tablespoon washing soda. I actually used more washing soda than that, and used about 1/8 of a cup. Let it dry and then use it in laundry. Mix fabric in 1 quart water mixed w/ 1/8 cup salt. Soak for 1 hour then let dry. Can toss into laundry once dry. 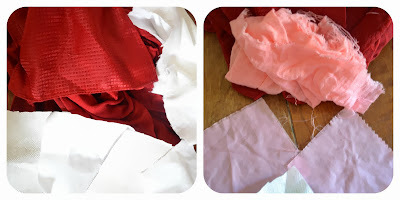 In my opinion, none of the homemade color catcher "recipes" that I have found worked at all, I feel your money is better spent either buying the commercial ones to use on those striped or white & color combo clothing, or sorting and checking pockets very carefully as much as possible.